Made from high-impact polystyrene, the lights are durable. Textured surfaces won’t show fingerprints. Instant-start feature allows the use of timers. 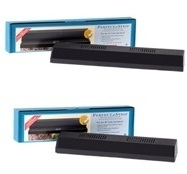 Top vents provide heat dissipation, and interior reflectors provide maximum light output into the aquarium. Water-resistant rubber boots protect switches from corrosion. Fits all brands of aquariums. Bulbs are not included with incandescent lights (12” only). Fluorescent lights include daylight spectrum fluorescent bulb.